As a natural and holistic living mama, I absolutely love anything great for our environment! 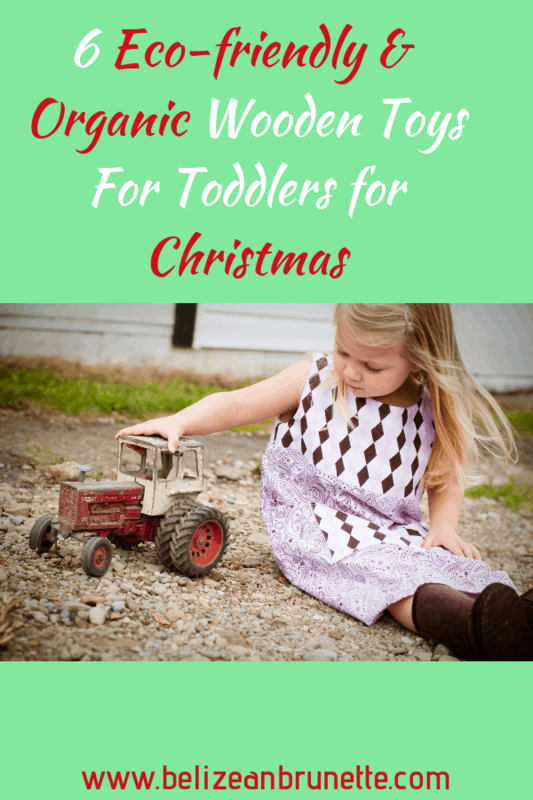 Here is a list of 6 eco-friendly organic wooden toys for toddlers for Christmas! This is by no means an exhaustive list but a great start to the negative effects of plastics! Babies and toddlers are especially at risk for these harmful chemicals because they are constantly sucking or chewing on toys or baby teethers. How many of these items do you have in your own home and are currently using? 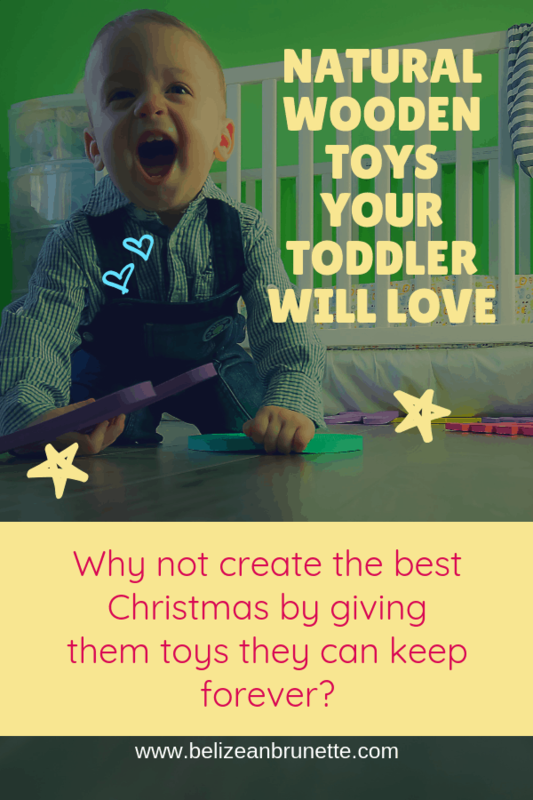 Why not protect your toddler from harmful chemicals and put your mind at ease by purchasing eco-friendly, wooden toys for Christmas gifts? How sweet is this wooden nativity scene? 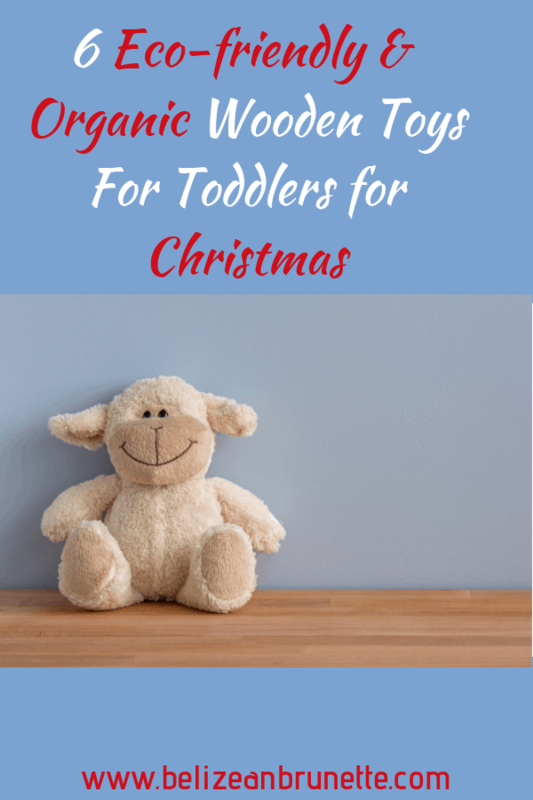 This is a great way for your toddler to connect with the Christmas story as they play with the 3 wise men, place baby Jesus in the manger, and count the darling sheep the shepherd brought along! This wooden toy nativity set is lovingly crafted out of Romanian wood, painted with non-toxic water based paint, and is an excellent way to go green. You may even want to start the tradition of gifting each of your children with this nativity set on their 1st or 2nd Christmas! You can always count on Etsy to find something unique and this personalized kids’ puzzle does not disappoint. The puzzle is made out of plywood and the letters carefully colored with eco-friendly ink. Not only will your child learn to recognize and spell her name, it’s a great way to develop motor skills as they place the letters. Bonus, teach them their colors from the colorful letters! You will want to save this as a keepsake as you have the option to have a sweet, loving message from you engraved on the back of the puzzle. Apparently geo boards are a thing, who knew? This geo board is made out of natural pine with multiple pegs or pins. It is designed as an educational toy as your child learns how to build different geometric figures and shapes. Not only does your child get to be creative with the rubber bands, but it also helps to develop her motor skills in large and small movements.Your child will learn the names of the shapes which gets them ready to recognize letters and numbers. You can use the geo board as a great way to help them to stay focused, improve their memory, and encourage them not to give up! Choose from multiple sizes and shapes! This is toy is such a fun and cheerful twist on the traditional xylophone we Americans know! Your toddler produces music by stirring the drumstick around repeatedly or tapping on the outside or inside in various ways. The sound is so pleasant, whenever I hear it it makes me feel happy. For some reason the tones reminds me of raindrops falling gently through the treetops of a large forest onto the forest floor. Listen and be delighted here. Made of organic wood, painted with colorful lead free paint, and then coated with a water based lacquer coating, this toy is sure to delight your child. My 3 year old watched the video repeatedly and said, “Mommy, I want to buy that! !” So it’s on our Christmas wish list! Oh, did I mention it’s made in Israel? How cool is that? And it still ships in 8-10 business days! Bonus: Personalize it for a memorable Christmas gift! Do you have a child with sensory issues who absolutely delights in touching everything? Then this toy set will quickly become a fan favorite! However, any child will delight in running and pressing fingers and toes over the ridges and ripples of these eco-friendly wooden tactile set. Your little cook will delight in the wooden spoon and the riffled mushroom that also comes in the set! Best of all the toy is made of sweet smelling juniper!!! Mmmm. How’s that for a Christmas scent? Handmade in Russia, it’s best to order this textured and tactile toys asap as it can take 8-10 weeks for delivery. Does your family love dogs? My little girl sure does!!! How marvelous is this stacked wooden dog puzzle? Montessori style it teaches your child patience in stacking the cute puppies, helps with memory, focus, logical thinking, and fine motor skills. Made of natural wood coated with beeswax and linseed oil, the toy not only will provide hours of fun for your child, the natural coating helps to keep it clean. Plus you can actually take the puzzle apart and use the individual dogs as decor! Don’t like dogs? Choose from a variety of animals including fuzzy bears, endearing elephants, and frisky foxes! Ships from Ukraine in 2-4 business days. I had a ton of fun compiling these 6 eco-friendly organic wooden toys for toddlers for Christmas! Remember to check your kiddos plastic toys for harmful chemicals, avoid heating plastic containers containing food or liquid in the microwave, and never let your child drink the contents out of plastic sippy cups or bottles left in a hot car! Here’s to a happy, healthy more vibrant childhood!! I love that Geo Board. Thank you so much for sharing these great products that are not harmful for our kids. It’s pretty cool isn’t it? I love how I stumble across the neatest items when I’m researching! My son has a few wooden toys and I love them! These were some great ideas! I love that there are so many more options than plastic toys. Funny, my preschooler was just wanting a nativity set at Costco. Told her we already have one but she can’t play with it because it is breakable. The wooden set would be perfect! Yay, yes it would and I really love that it can be used as a family tradition! I actually prefer wooden toys because they’re more aesthetically pleasing to me, but you’ve just listed so many more reasons to choose wood over plastic. I don’t think I realized how harmful those chemicals are! Yes I LOVE the look of wooden toys too!!! This is a great post! The list of harmful chemicals and common baby/toddler items that contain them is so educational. And, then the alternatives is awesome. Thanks for the education! You are welcome! 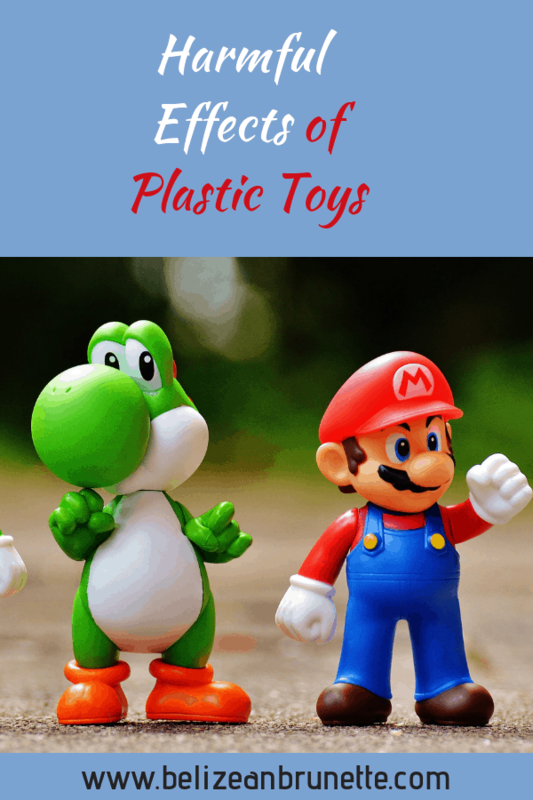 It’s shameful that companies can continue to make these harmful toys!